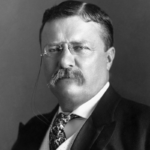 When Theodore Roosevelt became the 26th president following the 1901 assassination of President William McKinley, he was the youngest person to hold the office. He was president until 1909. Roosevelt was president during a time of significant immigration — between 1900 and 1915 America welcomed over 15 million immigrants — as many as it had during the previous 40 years. During that time period more than 13% of the U.S. population were foreign-born, with the vast majority of them from Europe. Key immigration laws passed during Theodore Roosevelt’s administration included the 1903 Anarchist Exclusion Act, which barred political extremists, beggars and epileptics from entering the country — the first time that political beliefs had been added to the list of disqualifications for immigration. The Naturalization Act of 1906 created a new Bureau of Immigration and Naturalization within the U.S. Commerce Department, and added English proficiency as a requirement for naturalization. The Immigration Act of 1907 added more categories of mentally and physically disabled people to the list of those banned from immigration. The Expatriation Act of 1907, meanwhile, required women to adopt the citizenship of their husbands. This had the effect of forcing American women to renounce their U.S. citizenship if they married men who were not U.S. citizens. We have room for but one flag, the American flag, and this excludes the red flag which symbolizes all wars against liberty and civilization just as much as it excludes any foreign flag of a nation to which we are hostile. We have room for but one language here and that is the English language, for we intend to see that the crucible turns our people out as Americans, and American nationality, and not as dwellers in a polyglot boarding house; and we have room for but one soul [sic] loyalty, and that is loyalty to the American people.